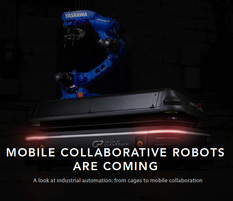 A look at industrial automation: from cages to mobile collaboration, here's why mobile cobots are so important for industrial automation. "Cobots, in laymen's terms, are safe for working alongside a person. In essence, cobots have democratized industrial robotics. Due to their flexibility, industrial manipulators can be integrated to make a once-stationary cobot mobile. This enables one integrated machine that promises new capabilities for the manufacturing workforce and bottom lines." This eBook defines key differences between mobile robots, collaborative robots and mobile collaborative robots. Get insights into how mobile cobots of the future will integrate into industrial environments for applications like picking and order fulfillment, and mobile machine tending. Understand safety and efficiency impacts, benefits to the workforce, and what manufacturing leaders can expect for future development.